Schizophyllan (SPG) is a gel-forming β-glucan from the fungus Schizophyllum commune. SPG is a high molecular weight (450 kDa) (1-3)-β-D-glucan that has a 1,6-β-monoglucosyl branch in every three 1,3-β-glucosyl residues on the main chain. SPG binds to Dectin-1  and triggers a signaling cascade leading to NF-κB activation. Detection of β-glucans by Dectin-1 receptor leads to the CARD9-dependent activation of NF-κB and MAP kinases . 1. Adachi Y. et al., 2004. 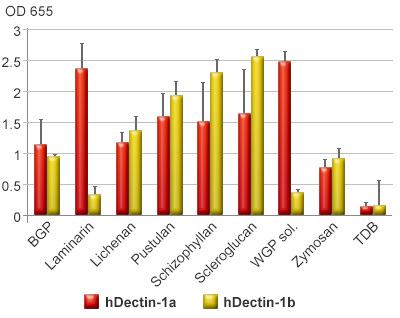 Characterization of beta-glucan recognition site on C-type lectin, dectin 1. Infect Immun. 72(7):4159-71. 2. Goodridge HS. et al., 2009. 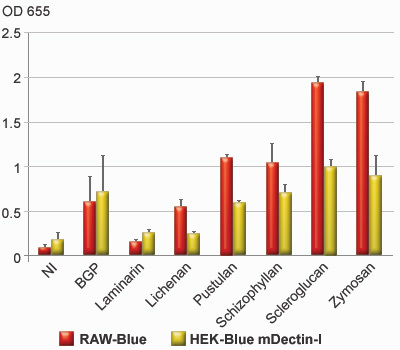 Beta-glucan recognition by the innate immune system. Immunol Rev. 230(1):38-50. Schizophyllan is shipped at room temperature. NMR spectroscopic structural characterization of a water-soluble β-(1→3, 1→6)-glucan from Aureobasidium pullulans.